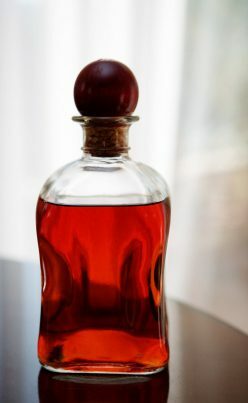 From New York to Michigan to Oregon, cherry season is in full swing, and back in Martha Washington’s day that meant it was time to mix up a batch of homemade cherry bounce—the first First Lady even documented her own version on husband George’s stationary. Fortunately, that tradition lives on today, and now’s the perfect time to make a batch yourself. An infusion of fresh cherries, sugar and spirit (typically brandy, whiskey or rum), cherry bounce offers a delicious taste of summer. And cocktail consultant Todd Appel has just the recipe. Appel updated the colonial classic to fuse plump, ripe cherries with rye whiskey and cane sugar for a taste of the season that’ll last long after the last leaves fall from the cherry trees. In a large saucepan, combine the cherries and sugar (and lemon juice, if using) and bring to a simmer over medium heat. Reduce heat to medium-low and continue to simmer for 20 minutes, stirring occasionally. Remove from heat and let cool. Swapping the classic whiskey-to-vermouth ratio.